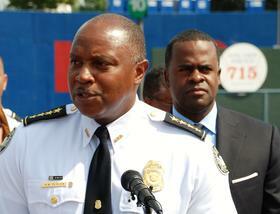 APD Chief George Turner speaks earlier this year as Mayor Kasim Reed looks on. The city of Atlanta hired its 2,000th police officer this week. Mayor Kasim Reed and police chief George Turner celebrated the benchmark earlier today. Now, to retain that force level, police union head Ken Allen says the city needs a long-term plan to address officer pay. “It wouldn’t matter what our number is, we’ll continually have a large turnover and not be able to sustain our numbers period if we don’t go to having some type of annual increase,” said Allen. After several years of no pay raises, police officers received an across-the-board 3.5 percent raise in 2010. And this year, officers with salaries below $60,000 are getting an additional 1.5 percent. Allen and Turner are both calling for consistent annual pay raises. Allen wants it in the area of two percent per year. Atlanta’s Chief Operating Officer Duriya Farooqui said compensation will be a larger part of the conversation as property tax revenue continues to rebound from years of recession. “We were operating in a context over the last two years where employees were feeling the effects of the most significant recession since the Great Depression. We chose to add police officers, we chose to do a step (pay) increase, and we chose to invest in technology and equipment and those choices require trade-offs,” said Farooqi. According to city data, APD attrition rates have gradually improved since the 2000’s. But Allen says morale will continue to suffer if pay raises remain inconsistent. “[The city] is reaching forward for a billion dollar dome that we’re going to take 200 million of our taxpayer dollars so the problem is not whether we’ve had the worst economic times, it’s what the priorities have been over those economic times,” said Allen. One of the compromises from this year’s contentious budget process was the creation of a special compensation committee composed of the mayor, city council members, and union reps. Its aim is to identify city funds for future employee pay raises. The committee is expected to hold its first meeting by the end of the year.